After buying every Mazinga I can get my hands on, I have decided to go back and get some of the common and easy to come by Shoguns. 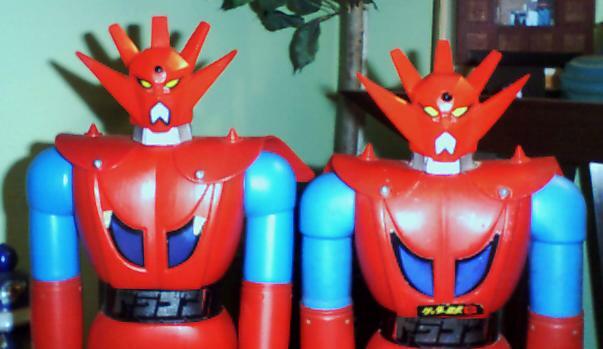 According to Rumor and memory I came to the conclusion that Dragun was the most common of the Shogun Warriors (Seem to remember a case of 4 of them as a child in a toy store 1 Mazinga, 1 Raydeen and 2 Dragun, probably wrong, but whatever). I jumped into buying Draguns left and right I got a version 3 (lighting bolts on the legs, no wrist saw blades) and a version 2 (saw blades, black leg V's, but has notches on wrist to hold the clip on star shooter) and last but not least a version 1 (Strap-on (no Jokes Gabe)star shooter) What I found was that aside from the difference that I just mentioned once again, just like Mazinga the 1st version(Repackaged Popy) was a completely different figure! Seems that the version 1 is a good 1/2-1 inch shorter then the version 2. He is about the same height at the shoulders as my Tall Head Mazinga. 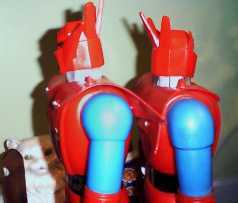 Version 1 has the trucks for the wheels on his feet molded on the feet while version 2 has them attached with clips. Version 1 (right) has squared off upper arm and Version 2 (left) has rounded. 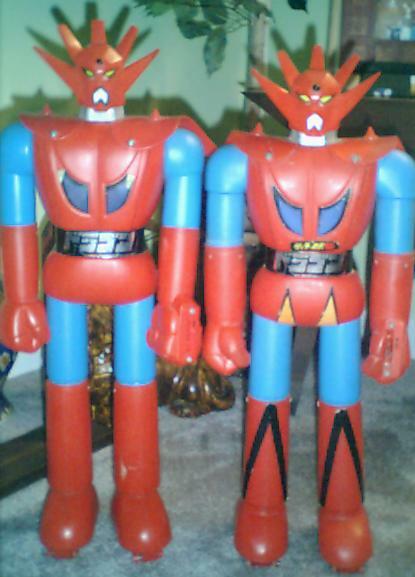 It looks as though the Mattel version uses the same arms as Mazinga while the version 1 uses completely different arms like the Popy original. A close examination of the head also shows that The headsculpt is different. The version 1 has more slender and sharper points as well as black paint on the neck. Once Agan Mattel didn't cut corners and,in the case of Dragun, add goofy stickers right off the bat. They tried to give the 2nd versions just as much detail as the Popy ones. 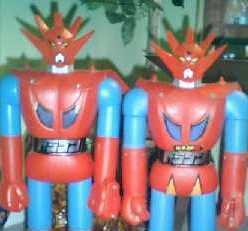 The only cost cutting measure I can see is the use of Mazinga Arms, but they also gave us a snap on shooter that they certinaly considered an improvement. Dragun looks like he's Constipated!